Yet another thing we can do with the OECD patent database is study the benefits of collaboration quantitatively. I have heard more than one cynic claim that a major effect of the Performance Based Research Fund is to increase the number of co-authorships (I’ll put your name on my paper, if you put mine on yours). Is such an effect visible in the patent database? Do the big collaborative networks that we have found just arise from cynical self-interest? Evidently not. 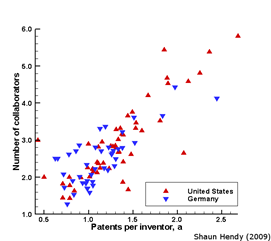 In fact, what we find is a strong correlation between the mean number of collaborators in an inventor network and the mean productivity (in terms of the number of patents per inventor) of that network. This is shown in a plot on the left where I have used data from inventor networks in Germany and the USA. The data shows that the people who collaborate do tend to be more productive, although of course this is a correlation, not necessarily a causation. However, from my own experience, I know there is a cost to collaboration — in time, patience and comfort. So it should perhaps not be surprising that if people are collaborating they are gaining some benefit. 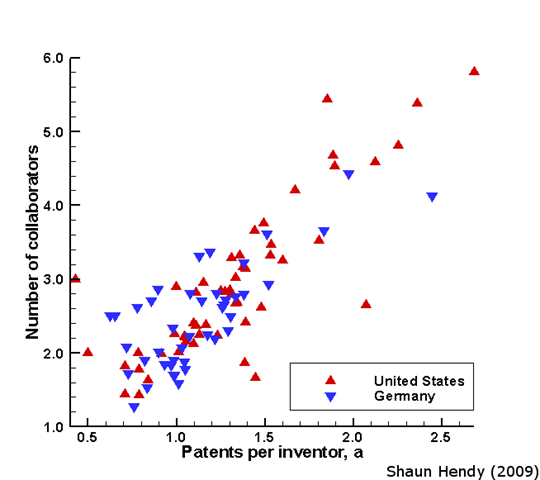 Do these measures correlate with inventor network size? Yes indeed. 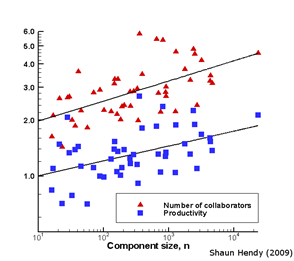 The plot on the right shows that both collaboration and productivity among inventors increase with the size of the collaborative network. Again, perhaps it is not surprising that productive, collaborative people will build large networks around themselves. However, one could still imagine such networks arising out of the cynical sharing of inventorships by inventors around a fixed pool of inventions — this doesn’t appear to be the case. The largest networks are both more collaborative and more productive. How do these networks form (if not by cynical trading of inventorships)? That is something we are still studying and although I do have more to say on this subject, I will save it for a later post.